No Awareness, No Research, No Cure! A bezoar (BE-zor) is a solid mass of indigestible material that accumulates in your digestive tract, sometimes causing a blockage. Bezoars usually form in the stomach, sometimes in the small intestine or, rarely, the large intestine. They can occur in children and adults. One type of bezoar (trichobezoar) may occur in people with psychiatric illness or developmental disabilities. Phytobezoars are composed of indigestible food fibers, such as cellulose. These fibers occur in fruits and vegetables, including celery, pumpkin, prunes, raisins, leeks, beets, persimmons and sunflower-seed shells. Phytobezoars are the most common type of bezoar. Trichobezoars are composed of hair or hair-like fibers, such as carpet or clothing fibers. In severe cases, known as "Rapunzel's syndrome," the compacted fibers can fill the stomach with a tail extending into the small intestine. Rapunzel's syndrome is most common in adolescent girls. Pharmacobezoars are composed of medications that don't properly dissolve in your digestive tract. Bezoars can cause lack of appetite, nausea, vomiting, weight loss and a feeling of fullness after eating only a little food. 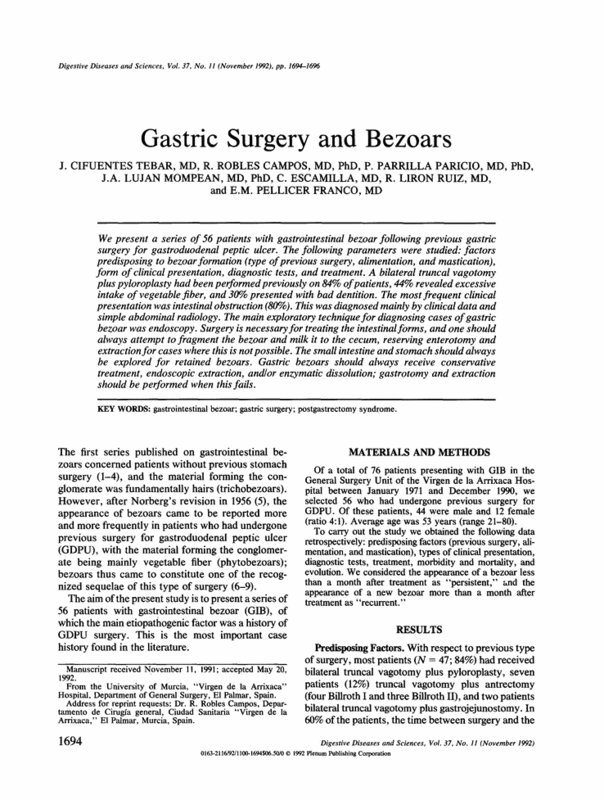 Bezoars can also cause gastric ulcers, intestinal bleeding and obstruction, leading to tissue death (gangrene) in a portion of the digestive tract. Small bezoars may pass through the digestive tract on their own or after you take medication to help dissolve the mass. Severe cases, especially large trichobezoars, often require surgery. If you don't have one of the risk factors for bezoars, you're not likely to develop them. If you are at risk, reducing your intake of foods with high amounts of indigestible cellulose may reduce your risk. A bezoar in someone's hand. Link available on my blog: www.emilysstomach.com. Bezoars were sought because they were believed to have the power of a universal antidote against any poison. It was believed that a drinking glass which contained a bezoar would neutralize any poison poured into it. The word "bezoar" comes from the Persian pād-zahr (پادزهر), which literally means "antidote". The Andalusian physician Ibn Zuhr (d. 1161), known in the West as Avenzoar, is thought to have made the earliest description of bezoar stones as medicinal items. Extensive reference to it is also to be found in the Picatrix, which may be earlier. In 1575, the surgeon Ambroise Paré described an experiment to test the properties of the bezoar stone. At the time, the bezoar stone was deemed to be able to cure the effects of any poison, but Paré believed this was impossible. It happened that a cook at King's court was caught stealing fine silver cutlery and was sentenced to death by hanging. The cook agreed to be poisoned instead. Ambroise Paré then used the bezoar stone to no great avail, as the cook died in agony seven hours later. Paré had proved that the bezoar stone could not cure all poisons as was commonly believed at the time. Modern examinations of the properties of bezoars by Gustaf Arrhenius and Andrew A. Benson of the Scripps Institution of Oceanography have shown that they could, when immersed in an arsenic-laced solution, remove the poison. The toxic compounds in arsenic are arsenate and arsenite. Each is acted upon differently, but effectively, by bezoar stones. Arsenate is removed by being exchanged for phosphate in the mineral brushite, a crystalline structure found in the stones. Arsenite is found to bond to sulfur compounds in the protein of degraded hair, which is a key component in bezoars. The Merck Manual of Diagnosis and Therapy notes that consumption of unripened persimmons has been identified as causing epidemics of intestinal bezoars, and that up to 90% of bezoars that occur from eating too much of the fruit require surgery for removal. A 2013 review of 3 databases identified 24 publications presenting 46 patients treated with Coca-Cola for phytobezoars. The cola was administered in doses of 500 mL to up to 3000 mL over 24 hours, orally or by gastric lavage. A total of 91.3% of patients had complete resolution after treatment with Coca-Cola: 50% after a single treatment, others requiring the cola plus endoscopic removal. Surgical removal was resorted to in four patients. To read more on this amazing published paper, please visit: http://link.springer.com/article/10.1007%2FBF01299861#page-1. My doctor told me that medications will dissolve it but has yet to call them in. I've been drinking soda because I've read that it will help dissolve the bezoar. My PCP noticed something sketchy on my x-ray, and then the GI confirmed it once he looked at it. My vitamin D is really low, according to my blood work, so they're going to call in injections for me since I'm not handling anything by mouth hardly at all right now. I've been laying outside, trying to soak up some sun. I have really intense stomach pain and I keep vomiting. No food is staying down and now I'm having issues with liquids, too. I think I'm going to make an appointment with my GI. I can't go on living like this, something has to be done. He mentioned a version of the gastric bypass that he wants to do on me. He thinks it will help but I'm still weighing the pros and cons of having the surgery. To pass the time tonight, and to keep my mind off of the pain, I started making a website. I wanted to have all of my GP things in once place - my resources/links, events, pictures, my Facebook Page (Emily's Stomach, which I want to get more likes for), a donation button to help me and my friends with medical bills), and the latest GP news. I've been thinking of making a website for a long time, but I haven't had time to do it. So, I sat down tonight, and in between bouts of vomiting, I've created it! I also made a logo that I might put on t-shirts with a gastroparesis design to fund raise money. My blog entries will now be posted on my website. I also linked, at the bottom of the pages, to my tumblr account, my pinterest board, my personal Facebook, etc if you would like to follow me and/or read things on there as well. I think I might do what my friend Melissa has done and make business cards with my logo, website, and blog on it. That way, I can help spread awareness. My goal is to have my own GP store so that I can help others with the proceeds in the future. It's been an idea that I've been thinking about for a long time. I'm just not artistic though, which means, I would have to depend on the designs of my friends. Speaking of friends, I have so many friends who are struggling with medical bills that I really want to help. I also wouldn't mind having some extra money to put towards my own medical bills. GP is expensive. I need to find a charity to link the donate button on my website to, I guess. I'll have to remember to do that in the morning, pending I actually get some sleep. I've been vomiting so much tonight that I pulled a muscle in my back and in my abdomen. I have been violently projectile vomiting but I haven't eaten anything! So, it's just bile... and that is making my throat swell like I have strep. I'm on a new anxiety medication, so I hope that helps. I'm really anxious and nervous about my website. I want people to use it as a resource. I want to put great information on there so that people will find it useful. All I have ever wanted was to help others. I hope I can do that by putting the latest news and resources on the site. I have also put pictures up that I've gathered over the past two years with various projects. I want people to see us and to understand GP. Sometimes, it's not real to someone unless they see a picture. I want all of my gp family to know that I think they're beautiful and brave for sharing their pictures. That reminds me, I need to do another picture request on Emily's Stomach on Facebook (www.facebook.com/emilysstomach). I want family members, co-workers, and others to post pictures of themselves supporting those with GP. I don't have a photo album like that that I'm allowed to use, even though I've worked on that project in the past. I want to post those on my website to show others that people do care, even if they may not know you. It means a lot to us who suffer daily. Sometimes, we desperately need that smile, you know? If you have Gastroparesis, then you have probably dealt with dumping syndrome at some point during your illness. Frequently, my friends get it when their stomachs decide to empty all at once, myself included. I thought I would write an article about it because it's not something I've already addressed and I wanted to bring awareness to the fact that it exists. I know a lot of people are scared or nervous to ask questions about pooping, so I'm going to try and do my best to explain dumping syndrome and how to get past it, especially when it's already hard for you to maintain fluids due to GP (gastroparesis). So, what is dumping syndrome? One of my friends posted a video that you can watch below, to explain what Dumping Syndrome is. "Dumping syndrome is a group of symptoms that are most likely to develop if you've had surgery to remove all or part of your stomach, or if your stomach has been surgically bypassed to help lose weight. Also called rapid gastric emptying, dumping syndrome occurs when the undigested contents of your stomach move too rapidly into your small bowel. Common symptoms include abdominal cramps, nausea and diarrhea. Most people with dumping syndrome experience symptoms soon after eating. In others, symptoms may occur one to three hours after eating. Some people experience both early and late symptoms. Dumping syndrome is managed by adjusting your diet. In more-serious cases of dumping syndrome, you may need medications or surgery. A study of more than 1,100 people who had their stomachs surgically removed found that about two-thirds experienced early symptoms and about a third experienced late symptoms of dumping syndrome. Some people experience both early and late signs and symptoms. No matter when problems develop, however, they may be worse following a high-sugar meal, especially one that's rich in table sugar (sucrose) or fruit sugar (fructose). In dumping syndrome, food and gastric juices from your stomach move to your small intestine in an uncontrolled, abnormally fast manner. This is most often related to changes in your stomach associated with surgery, such as when the opening (pylorus) between your stomach and the small intestine (duodenum) has been removed during an operation. The pylorus acts as a brake so that stomach emptying is gradual. When it's removed, stomach material dumps rapidly into the small intestine. The ill effects of this are thought to be caused by the release of gastrointestinal hormones in the small intestine, as well as insulin secreted to process the sugar (glucose). Dumping syndrome can occur after any operation on the stomach as well as after removal of the esophagus (esophagectomy). Gastric bypass surgery for weight loss is the most common cause today. It develops most commonly within weeks after surgery, or as soon as you return to your normal diet. The more stomach removed or bypassed, the more likely that the condition will be severe. It sometimes becomes a chronic disorder. Your doctor may use some of the following methods to determine if you have dumping syndrome. Medical history and evaluation. Your doctor can often diagnose dumping syndrome by taking a careful medical history and then evaluating your signs and symptoms. If you have undergone stomach surgery, that may help lead your doctor to a diagnosis of dumping syndrome. Blood sugar test. Because low blood sugar is sometimes associated with dumping syndrome, your doctor may order a test (oral glucose tolerance test) to measure your blood sugar level at the peak time of your symptoms to help confirm the diagnosis. Gastric emptying test. A radioactive material is added to food to measure how quickly food moves through your stomach. Most cases of dumping syndrome improve as people learn to eat better for the condition and as the digestive system adjusts. There's a good chance that changing your diet will resolve your symptoms. (See recommendations under Lifestyle and home remedies.) If it doesn't, your doctor may advise medications or surgery to address the problem. Your doctor may prescribe certain medications to slow the passage of food out of your stomach, and relieve the signs and symptoms associated with dumping syndrome. These drugs are most appropriate for people with severe signs and symptoms, and they don't work for everyone. Acarbose (Precose). This medication delays the digestion of carbohydrates. Doctors prescribe it most often for the management of type 2 diabetes, and it has also been found to be effective in people with late-onset dumping syndrome. Side effects may include sweating, headaches, sudden hunger and weakness. Octreotide (Sandostatin). This anti-diarrheal drug can slow down the emptying of food into the intestine. You take this drug by injecting it under your skin (subcutaneously). Be sure to talk with your doctor about the proper way to self-administer the drug, including optimal choices for injection sites. Long-acting formulations of this medication are available. Because octreotide carries the risk of side effects (diarrhea, bulky stools, gallstones, flatulence, bloating) in some people, doctors recommend it only for people who haven't responded to other treatments and who are not candidates for surgery. Doctors use a number of surgical procedures to treat difficult cases of dumping syndrome that are resistant to more conservative approaches. Most of these operations are reconstructive techniques, such as reconstructing the pylorus, or they're intended to reverse gastric bypass surgery. A last resort for people who are not helped by any other treatment is to insert a tube into the small intestine through which nutrients can be delivered." After gastric surgery, it can be more difficult to regulate movement of food, which dumps too quickly into the small intestine. Eating certain foods makes dumping syndrome more likely. For example, refined sugars rapidly absorb water from the body, causing symptoms. Symptoms may also happen after eating dairy products and certain fats or fried foods. Water pulled out of the bloodstream moves into the small intestine. Hormones released from the small intestine into the bloodstream affect blood pressure. The symptoms of this late phase may happen due to a rapid rise and fall in blood sugar levels. The cause of this rapid swing in blood sugar may be worse when eating sweets or other simple carbohydrates. Many people find that taking steps like these greatly reduces symptoms of dumping syndrome. Also avoid dairy products and alcohol. And avoid eating solids and drinking liquids during the same meal. In fact, don't drink 30 minutes before and 30 minutes after meals. Use fiber supplements, such as psyllium (Metamucil or Konsyl), methylcellulose (Citrucel), or guar gum (Benefiber). **NOTE: If you have Gastroparesis as well, please consult your doctor as high fiber content can make our condition worse. Use sugar replacements, such as Splenda, Equal, or Sweet'N Low, instead of sugar. Go for complex carbohydrates, such as vegetables and whole-wheat bread, instead of simple carbohydrates, such as sweet rolls and ice cream. If you have any questions or comments about the article, feel free to email me. I'm currently working on an article about pregnancy and GP. I'm gathering research and will hopefully, have it out in the next two weeks. Please email me if you have an idea for an article that you'd like to see and/or questions/comments: emilysstomach[at]gmail.com.